Hello friends! If you don't know, I've been out of the UK for the past three-and-a-bit weeks visiting my sister and best friend in Melbourne. To be honest, Australia has never been on my 'to visit' list; I just never had any interest in it. Hong Kong, on the other hand, has always been right at the top. My grandad used to go there for work and has raved about it to me since I was this high. I decided to stop off there for a week on the way and my lovely pal Lily flew in from Dubai to meet me. She'd been there before so knew the ins and outs of the place; on top of that, our friend Michelle has written some incredible guides to Hong Kong since she lived there for two years. It was no surprise to me at all that I loved Hong Kong; here are my five highlights. Somehow, I totally missed the escalator on most of the online guides I read; perhaps it's just such a normal part of Hong Kong life that some travellers don't think to include it! Lily mentioned it in passing because we were nearby. Like me, Lily likes wandering aimlessly through cities and the escalator is perfect for that. It's a single, rather than double escalator and only travels one way. It leads from halfway up the peak down to the main part of Hong Kong and travels down between 6am and 10am so quarter of a million people can use it to get to work. Then at 10am, it changes and travels back up the hill so everyone can get home. It's brilliant for getting from one place to another or just for the fun of using it! The ferry crosses Kowloon Bay, leaving every few minutes and costs the equivalent of 30p and everyone uses it - there are businessmen in suits and working class scum like me sharing a bench! You get the best possible view of the city that's cheap as chips. Speaking of views, Lily and I got the tram up The Peak. The last time she'd been in Hong Kong, it was so cloudy she couldn't see anything so she was glad to get a second go at it. The tram track is so steep it feels like a rollercoaster - I recommend trying to get a seat if you can. Lily and I had to stand on the way up and were clinging on for dear life! I would love to see what Hong Kong looked like before all of these buildings sprouted up. When I go back, I plan to see a lot more of the natural side of the island and get some hiking done. Again, this was a pretty cheap excursion - about a tenner to get the tram up and get onto the viewing platform. 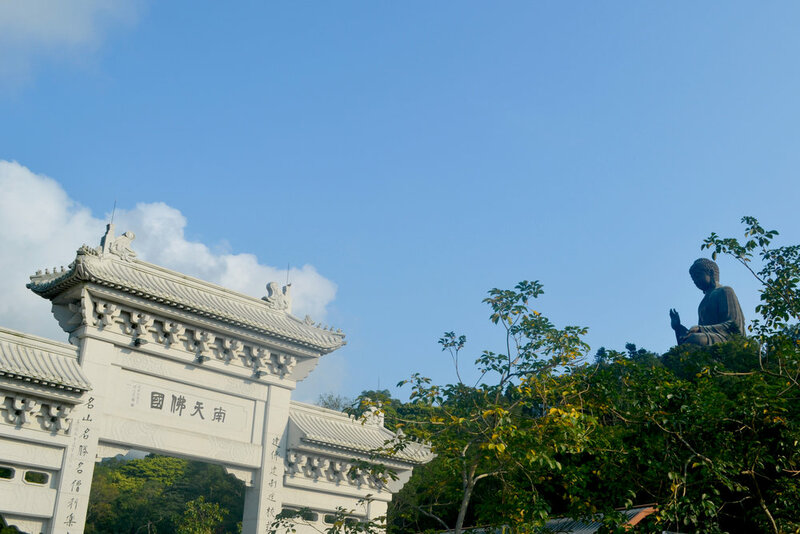 No trip to Hong Kong would be complete without a visit to the Buddha on Lantau island. You wouldn't think that Lily and I went running relatively often - we huffed and puffed all the way up those steps! I loved getting the cable car all the way up into the mountains - the views were spectacular. Lily is one of my blogger friends and I don't think we've met in real life more than half a dozen times. Avocado on toast was our breakfast ritual and I loved the chats we had every morning about, well, basically everything that's happened in our lives up to this point. It was really amazing of her to come and meet me in Hong Kong just so I wouldn't be by myself and I'm very lucky it allowed us to become really close friends. I miss her! More highlights from my trip on their way in the next week or two!